Industra-Coat 3137MUV is a two component 100% solids epoxy seal coat which incorporates UV resistance additives that can be used either as a coating or filled with paint chips, marble chips and colored sand mixtures to provide an infinite array of color schemes or patterns. chemical resistance information is available through your sales representative. #3137MUV in aggregate filled systems, with or without a clear urethane topcoat. Color stability or gloss may be affected by environmental conditions such as high humidity, chemical exposure, UV exposure or exposure to lighting such as sodium vapor lights. reduce (UV light) color changes. Substrate temperature must be 5°F above dew point. For best results, apply with a ¼” nap roller. All new concrete must be cured for at least 30 days prior to application. Apply a suitable primer before using this product See reverse side for application instructions. Physical properties are typical values and not specifications. See reverse side for limitations of our liability and warranty. 1) PRODUCT STORAGE: Store product in an area so as to bring the material to normal room temperature before using. Continuous storage should be between 60 and 90 degree F. Low temperatures or temperature fluctuations may cause crystallization. 2) SURFACE PREPARATION: The most suitable surface preparation would be a fine brush blast (shot blast) to remove all laitance and provide a suitable profile. All dirt, foreign contaminants, oil and laitance must be removed to assure a trouble free bond to the substrate. plastic sheet testing is also a good method to determine if any hydrostatic pressure problems exist that may later cause disbanding. available. After the two parts are combined, mix well with slow speed mixing equipment such as a jiffy mixer until the material is thoroughly mixed and streak free. After mixing, transfer the mixed material to another pail (the transfer pail) and again remix. The material in the transfer pail is now ready to be applied on the primed substrate. Improper mixing may result in product failure. 5) PRODUCT APPLICATION: The mixed material can be applied by brush or roller. However, the material can also be applied by a suitable serrated squeegee and then back rolled as long as the appropriate thickness recommendations are maintained. Maintain temperatures and relative humidity within the recommended ranges during the application and curing process. If concrete conditions or over aggressive mixing causes air entrapment, then an air release roller tool should be used prior to the coating tacking off to remove the air entrapped in the coating. 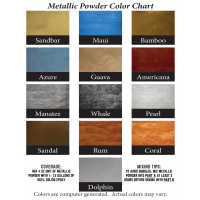 This product can be used with various colored sand in a broadcast system or other suitable aggregate can be used in conjunction with this product to achieve a variety of color and application patterns. Contact your representative for details as necessary. 6) RECOAT OR TOPCOATING: If you opt to recoat or topcoat this product, you must first be sure that the coating has tacked off before recoating. Always remember that colder temperatures will require more cure time for the product before recoating or topcoating can commence. Before recoating or topcoating, check the coating to insure no epoxy blushes were developed (a whitish, greasy film or deglossing). If a blush is present, it must be removed prior to topcoating or recoating. 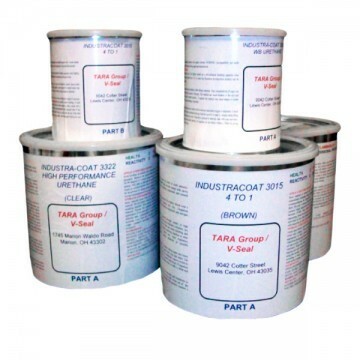 Many epoxy coatings and urethanes are compatible for use as a topcoat for this product as well as multiple coats of this product. 8) FLOOR CLEANING: Caution! Some cleaners may affect the color. Test each cleaner in a small area. If no ill effects are noted, you can continue to clean with the product and process tested. We warrant that our products are manufactured to strict quality assurance specifications and that the information supplied by us is accurate to the best of our knowledge. Such information supplied about our products is not a representation or a warranty. It is supplied on the condition that you shall make your own tests to determine the suitability of our product for your particular purpose. Listed physical properties are typical and should not be construed as specifications. NO WARRANTY IS MADE, EXPRESSED OR IMPLIED, REGARDING SUCH OTHER INFORMATION, THE DATA ON WHICH IT IS BASED, OR THE RESULTS YOU WILL OBTAIN FROM ITS USE. N0 WARRANTY IS MADE, EXPRESSED OR IMPLIED, THAT OUR PRODUCT SHALL BE MERCHANTABLE OR THAT OUR PRODUCT SHALL BE FIT FOR ANY PARTICULAR PURPOSE. NO WARRANTY IS MADE THAT THE USE OF SUCH INFORMATION OR OUR PRODUCT WILL NOT INFRINGE UPON ANY PATENT. We shall have no liability for incidental or consequential damages, direct or indirect. Our liability is limited to the net selling price of our product or the replacement of our product, at our option. Acceptance of delivery of our product means that you have accepted the terms of this warranty whether or not purchase orders or other documents state terms that vary from this warranty. No representative is authorized to make any representation or warranty or assume any other liability on our behalf with any sale of our products. Our products contain chemicals that may CAUSE SERIOUS PHYSICAL INJURY. BEFORE USING, READ THE MATERIAL SAFETY DATA SHEET AND FOLLOW ALL PRECAUTIONS TO PREVENT BODILY HARM. Recommended for warehouses, kitchens, restrooms, and other areas where either a high build clear product is needed or where a decorative filled floor is desired and better UV resistance is needed.